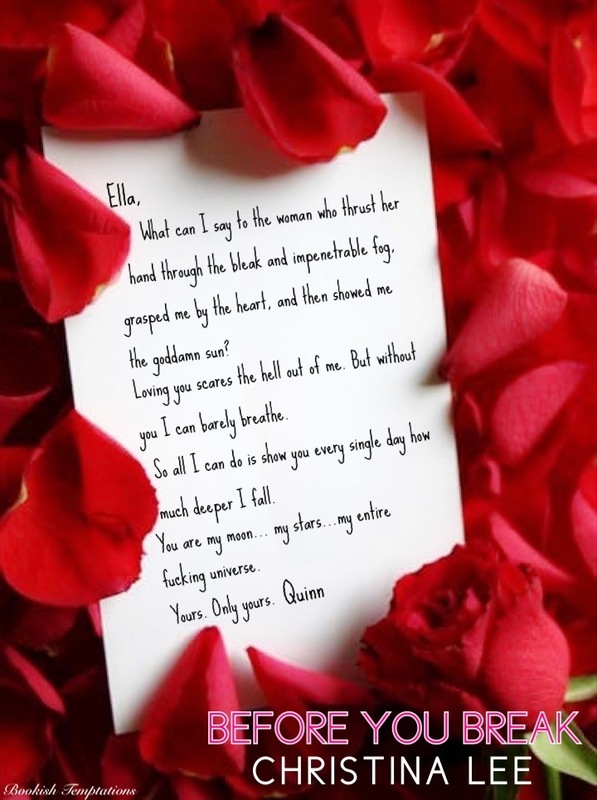 Valentine’s Week: A Love Letter from Quinn (Before You Break by Christina Lee) with GIVEAWAY! We have an ebook copy to give away from Christina too. Giveaway will run through February 18th. To enter just leave a comment. This entry was posted in Book Boyfriend, Book Recommendation, Book Release, Characters, Christina Lee, Fantasy boyfriends, Favorite Authors, Favorite Book Boyfriends, Favorite Books, Giveaways, New Adult, New Release, Romance and tagged author, Before You Break, Christina Lee, Ella, favorite book, Love letter, Quinn, reccommended book, valentine special, Valentines Week. Lovin these love notes….more books for the to read list. Love the love notes, can’t wait to read this. How sweet … can’t wait to read! What a love note! lol! I would love a new read! Such a beautiful note! I would love to read this. I loved All of You. Can’t wait to read more from Christina. Sigh! What a perfect love note. Thanks for the chance. Wow!! I have to read this book! Thanks for the giveaway! Reading the letter has made curious about the book. He’s a keeper, that Quinn. For sure! I like him already, thank you for the giveaway! Thanks for the intro to something new to read. Thanks for another great giveaway and another add to my tbr list! Loved the first one, can’t wait to read this!